Home away from home. Our family of 4 (2 adults/2kids) stayed at this unit for a get away over Thanksgiving. The owners have insured that all the comforts of home are in place for your vacation. 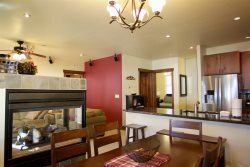 Comfortable beds, a well stocked kitchen, balcony with grill, washer and dryer and walking distance to Copper Mountain for skiing. The condo was very clean and well taken care of. Reservations, check in and departure were easy due to our reservation agent (Joshua). He put everything together for us on a last minute request. We would highly recommend a stay at this condo. - T.S. This was our second time staying at alpine Retreat and both times were a total blast. The rooms are spacious, the living areas are comfortable, and its setting up in the quiet hills above town is perfect. The "cabin" is very up-to-date and has every amenity needed for a great vacation. It's just about a five minute drive to the heart of old Breckenridge and all the shops and restaurants. Also, it is very close to Breckenridge skiing, and not too far from other spots like Keystone or Copper. We intend to continue using this location for a vacation spot for many years to come! - J.K. I had a wonderful time this summer at Red Mountain Retreat. Working with 5 Diamond Lodging was incredibly easy and professional. Will definitely use them again!